A recent multinational study shows that among HIV-infected individuals receiving treatment, smoking poses a greater burden on mortality than the virus, which showcases the great progress that has been made in treating a disease once viewed as a death sentence. It also highlights the need to look beyond reducing viral loads and providing comprehensive care to those living with HIV. The study, which followed nearly 18,000 HIV-infected people on retroviral therapy from North America and Western Europe, found that for a typical 35-year-old man with HIV, smoking reduced life expectancy by about eight years, compared with a six-year reduction directly caused by the virus. The prevalence of current or former smokers in this study group was around 60%, highlighting a population in which smoking-cessation interventions should be a priority, as it can decrease a tremendous looming health care burden as the HIV-infected population ages. In fact, the study showed that HIV-infected people who never smoked and had good white cell counts had a life expectancy that was virtually identical to that of the general population. “It is important not to lose sight of the mental health aspects of the disease,” said APA CEO and Medical Director Saul Levin, M.D., M.P.A., noting that depression, memory problems, and substance use are all risks among the HIV community. He pledged that APA's Office of HIV Psychiatry will continue to lead efforts in research, education, and outreach about the many aspects of living with HIV. The lifespan statistics echo those of a newly-released CDC report showing that someone diagnosed with HIV at age 20 has a life expectancy of 71 years with current medications, showing that HIV/AIDS does not preclude someone from living a long and full life—if they take prescribed medicines, adhere to care, and receive supportive services such as proper nutrition, housing, and mental health services. “We have come a long way in a little over three decades, but continuing efforts at prevention and care—physical, psychological, and social—must be sustained, especially with communities in which there is a high risk of people becoming infected with HIV,” said Marshall Forstein, M.D., an associate professor of psychiatry at Harvard Medical School and a former chair of APA’s Commission on AIDS. 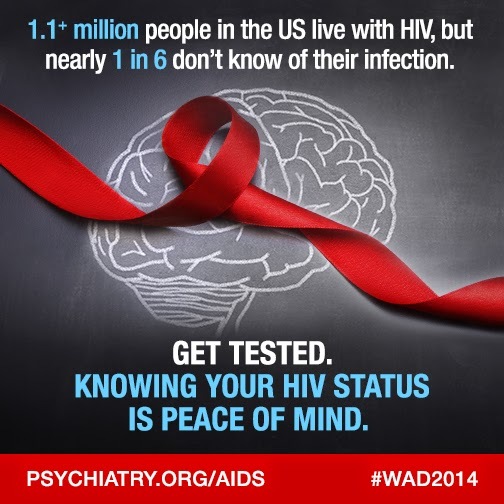 To read about the importance of integrating HIV testing and care in mental health facilities, see the Psychiatric News article, "HIV in Mental Health Facilities Sometimes Gets too Little Attention." Also, watch for the December 5 issue of Psychiatric News, which features additional articles related to HIV and mental health.